This is a new set of 12 bali style pewter beading toggle clasps with an antique silver finish. These can be used on larger necklaces or bracelets. 4 Smooth toggle clasps measuring 12 mm with a 15 mm long bar. 4 Cut patterned toggle clasps measuring 13 mm with a 21.5 mm long bar. 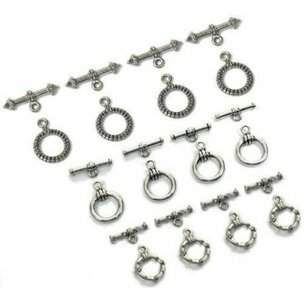 4 Round toggle clasps measuring 12 mm with a 15 mm long bar.